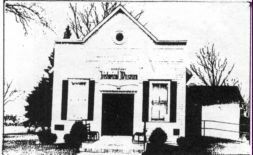 The white frame building at the west end of Chamber Park, which serves as our Historical Museum, was the original Wheeling Village Hall. It was built in 1895 at the cost of $553.26 for a building "20 by 30 foot", with two cells at the western end, 7 1/2 by 9 foot each." It served as a meeting place for the trustees, a police station and a court. A lean-to on one side, housed a hand pumper which was purchased by the Volunteer Fire Department in 1904. The pumper is now located at the Wheeling Village Fire Station. There is one abbreviated cell remaining and an addition has been added at the rear of the building and also a basement. The latter serves as a working area and research center for the museum. Every inch of space upstairs is used for permanent and changing exhibits. This building was originally located at 84 South Milwaukee Avenue and was purchased by the Wheeling Park District and moved to it's present location in 1978.